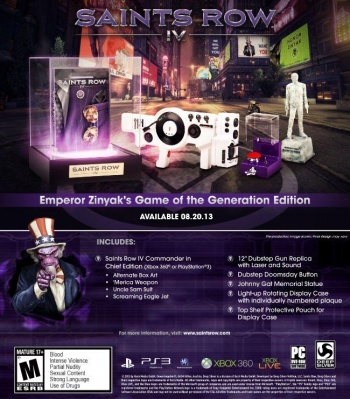 The new Saints Row IV Game of the Generation Edition gives you physical loot to use when displaying your loot. It's hard to imagine another series that embraces excess as an art form quite like the Saints Row series. The franchise started life as a Grant Theft Auto sandbox, only to somehow become a Crackdown-styled superhero game. Saints Row IV's Super Dangerous Wub Wub set already embodies a distinct lack of seriousness, and now Deep Silver is stepping forward with yet another limited edition. The Saints Row IV Game of the Generation pack doesn't only include extras from the previous collector's set, it features a rotating light-up display case perfect for showing off your game to visiting friends and family. The Game of the Generation edition can be purchased for $129.99, and gives you a copy of the game, a "Display Case of Everlasting Glory", and a velvet pouch specifically for said case. You'll also get the physical goods from the Super Dangerous Wub Wub Edition, including a 12-inch Dubstep gun, an 8-inch miniature of Johnny Gat, and a Dubstep Doomsday button. Finally, pre-orders will include the Commander in Chief in-game items, specifically the 'Merica weapon, the Uncle Sam costume, and the Screaming Eagle Jet. All told, the Game of the Generation edition sounds like a highly appropriate copy of the game to buy, and still gives fans a few weeks to change their pre-orders if they so choose. Saints Row IV will launch for PC, Xbox 360, and PS3 on August 20, 2013.